Girls Wear Blue Too: Tidbinbilla Nature Reserve. 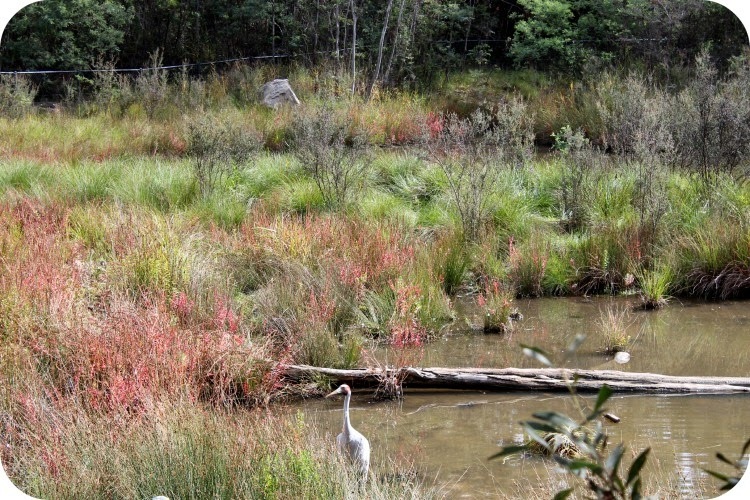 On Thursday I took the Children to Tidbinbilla nature reserve It is such a beautiful time of the year to go and it was our first visit. Even the 45 minute drive out there was quite beautiful, everything is so green after the recent rain and the Leaves are starting to change so there was some lovely Autumnal scenery. 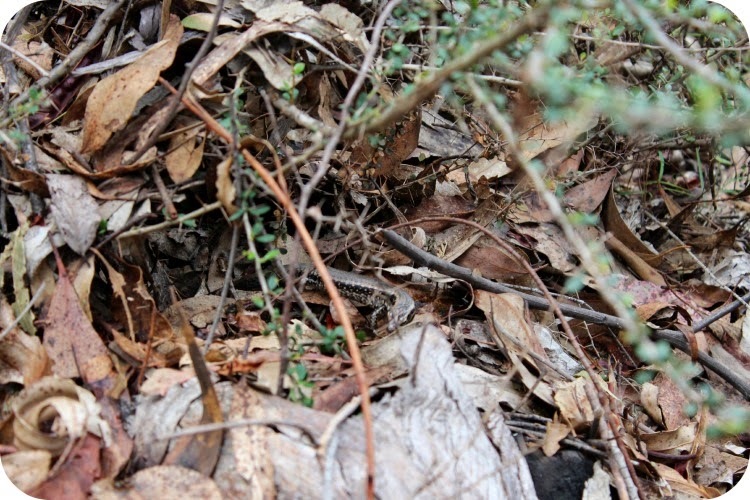 I had the three Children with me and the hope was that we could try to spot a Koala. At the visitors centre upon consultation with staff I decided the eucalypt Forrest walk and the sanctuary loop were the two closely located walks we could manage and see the most wildlife on. There were so many walking trail options. 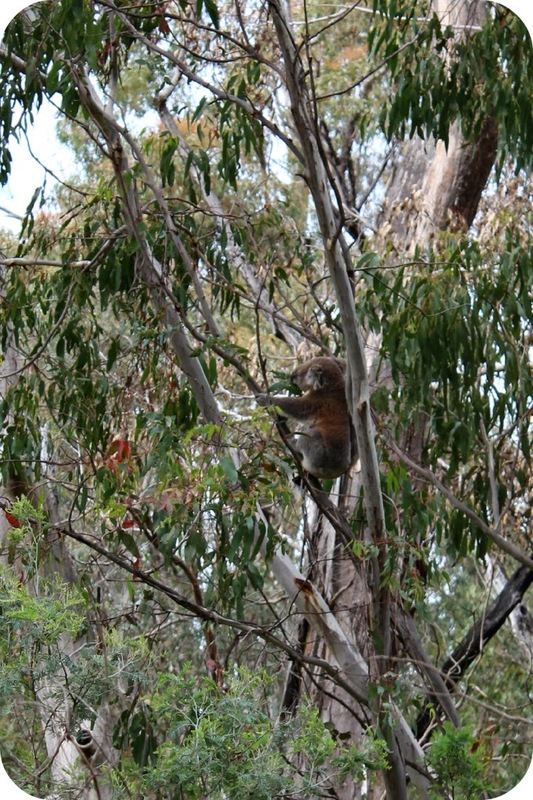 I was told at the visitors centre that the Koala population was introduced and 4 of them were in a viewing enclosure close to the entrance of the Eucalypt Forrest, so we would be ensured of seeing some, and if we were lucky we might also spot one in the Forrest. I felt from the moment we got there we were blessed with good timing. 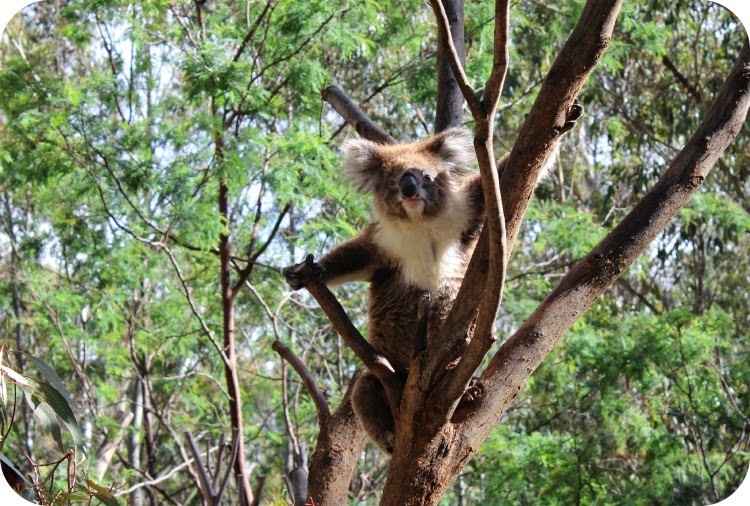 This Koala above was in the front enclosure and was moving about, as we watched it went from here to a less visible space and curled up nears its youngster for a snooze. The Kangaroos above were at the first place we stopped inside the reserve, which was a bathroom break. 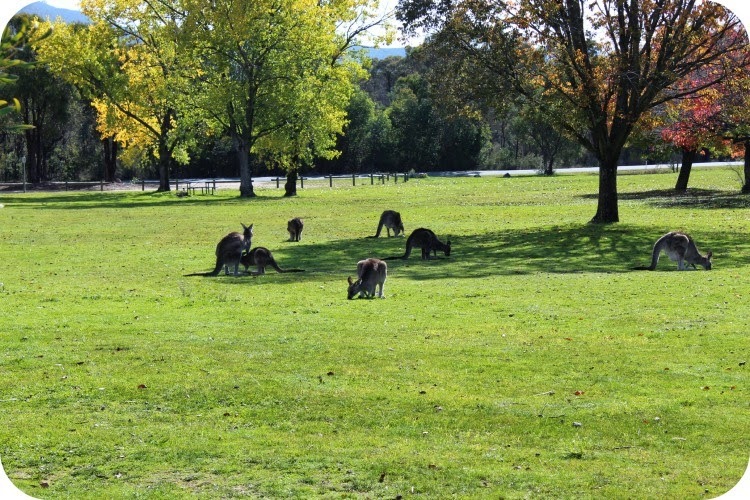 There were loads of Kangaroos lazing around in various places that could be seen from here. 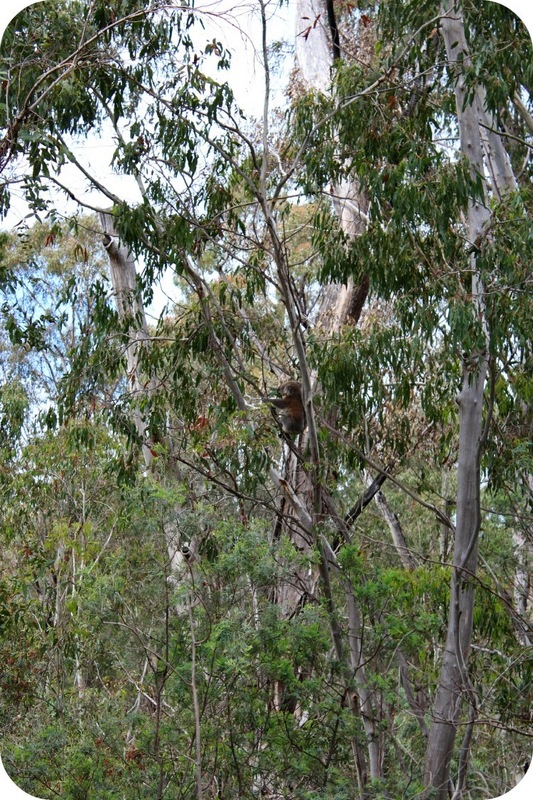 Then we drove up to the Eucalypt Forrest, we saw the Koala that I photographed above and then, while we were walking, up at the top of the loop we saw one in the Forrest!! It was quite low and not far from the path at all, the following photos are both the same image, the second photo is a crop. You can see based on the habitat how lucky I think we were to actually see one! We left the Car at the Eucalypt Forrest and crossed the road to the Sanctuary. When we came to the Brolgas they were quite close to our side of the fence. Gorgeous Birds. This little lizard was sunning on a walkway foot bridge and scurried off as we approached, if we took our eyes off it for a second it would blend so seamlessly into its surrounds it was very hard to locate again. 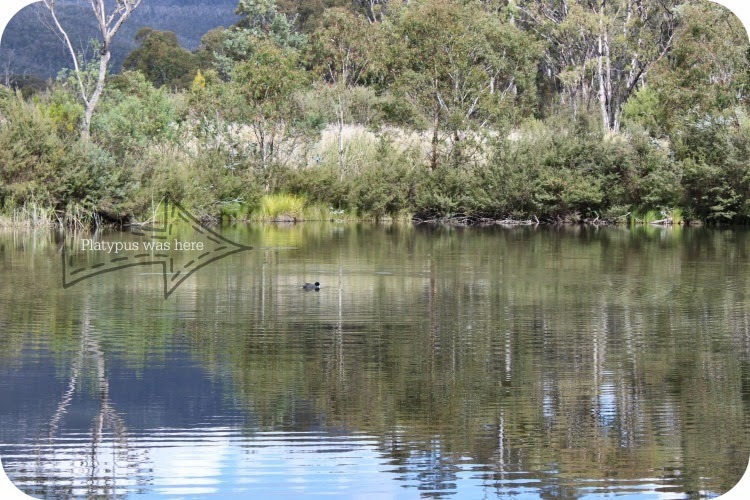 When we got the the weir we did see two platypus diving and surfacing way out in the water. A guide we had met earlier on the walk told us where they were most likely to be seen and how to spot them. If he hadn't we would not have known what we were seeing. He told us to watch for the ripples and I did see sunlight flashing off wet fur at one point. 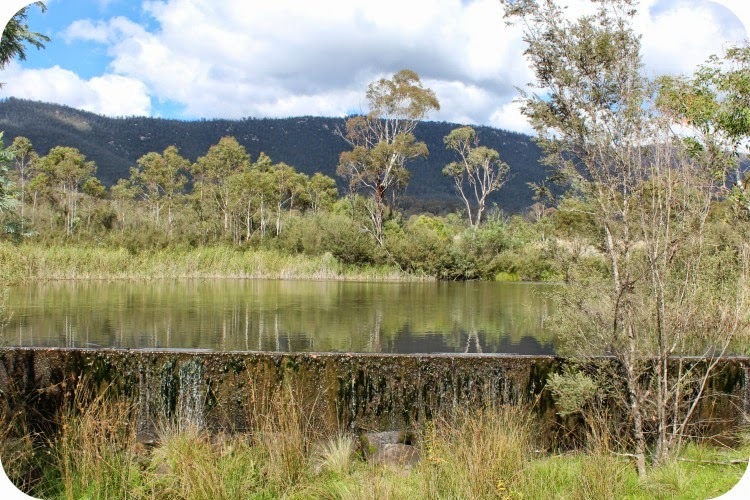 The weir itself was picturesque with its Mountainous background, still water and beautiful bushland reflection. We saw lots of other wildlife too; when we had packed the car to leave, after Our picnic lunch at the discovery playground, a couple of Emus stunned us by strolling by and disappearing into the surrounding bush. We will be going to Tidbinbilla more often now that I know what treasure it is and I have a mind to go out without the children one day when School goes back, yes, School Holidays are drawing to a close; they seem to have passed in the blink of an eye this time. What a beautiful day out! I must take my two next time we are down. Brilliant. Thanks for sharing this experience. We're thinking of crossing the desert at the end of the year and will be looking to spend time in your neck of the woods with children's paternal grandparents. This looks like an amazing day trip, a good time to stretch our legs and get some fresh air. Brilliant. Loving the platypus photo too!!! Something just have to be committed to memory don't they? Hi I'm Tammy, happiest in a pair of jeans, pottering about and enjoying a nice cup of Tea. Welcome have a little peek at whats capturing my interest. Words, pictures and designs on this blog are mine, unless expressly stated otherwise. I will credit and endeavour to link back to other designers, photographers, writers, businesses and artists duly and with Transparency. Please ask my permission before reproducing anything you see published on my blog, extend at least, the common artistic courtesy of a link back to me and my content.